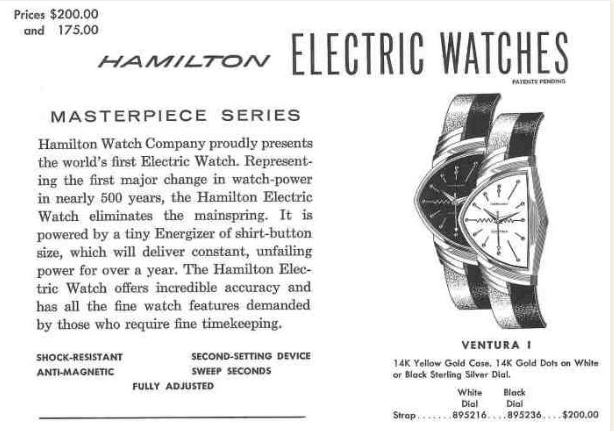 In 1957 Hamilton introduced the world's first electric watch movement. Hamilton's electric movement was revolutionary in that it's basically a little electric motor with mechanical watch-like components. In fact, unlike a quartz watch, the Hamilton Electric ticks! One of the best known Hamilton Electric watches is the Ventura. Like many electrics, the Ventura is a futuristic looking asymmetrical shape. It looks very similar to another electric model called the Pacer, except the lugs are differently shaped and the Ventura is solid gold. The Ventura was introduced in 1957 with the original electric movement, the model 500. The 500 was a finicky design and Hamilton soon replaced the 500 with the 500A. That version was a bit temperamental too and eventually it was replaced by the model 505. The Ventura was produced through 1962 and you may find them with any of these movements inside. Dials came in white as well as black and later on also with a diamond dial. The original strap was black and gold striped... definitely making a statement for anyone who wore one, including Elvis Presley. Personally, I have a love / hate relationship with the Electric models. I love their aesthetic designs... I really do. I'm not too crazy about the finicky electric movement though (no offense to those electric die hards out there). I've only had one Electric model - a Railroad Special. It ran about 10 minutes fast per day. It turns out that it's such a challenging movement to work on that many watchmakers want nothing to do with them. Those that can work on them can be quite expensive and the cost to fix a RR Special pretty much exceeds it's value. Of course, a Ventura is well worth the maintenance costs and a nice example can fetch $2,000 or more. But, alas, I don't have $2000 so you won't see a Ventura in my collection any time soon. The design is so popular though that Hamilton released a registered edition of the Ventura in the 1990's. In fact, it was featured in the original Men In Black movie. That model uses a quartz movement though and it's readily obtained in both white or yellow gold plate for well under $500. I've been wanting to get a modern Hamilton for several years now. I don't really want a quartz model so that cuts out a lot of the lower priced options. Most modern watches today are 40mm or larger in diameter. That looks mighty big and they look pretty silly in my opinion when they get to be 46mm or more. I've had a really hard time choosing the right mechanical or automatic model for me... until recently. It turns out there's a mid-sized Ventura model with an automatic movement currently available. I immediately realized that it was the modern watch for me... as it's instantly recognizable as a Hamilton and I wanted a watch that said, "I'm a Hamilton man". So here it is, on my wrist. The dial is see through so you can see the escape wheel happily spinning away (near the 10 o'clock marker). And the back is a display back so you can also enjoy seeing the movement doing it's thing when you take the watch off. The only thing I don't like about the watch is it's a little hard to see the hands at times and then correlate their position relative to the hour markers. It takes a little getting used to... but I do love this watch! I've enjoyed reading your blog posts. I've always been a huge Hamilton Watch fan, as my favorite aunt worked for the Hamilton Watch Co. in Lancaster, PA for more than a few decades. She gave my dad one of these electric Ventura watches as a graduation present. I think he said it actually worked for a grand total of about a week before it died. She tried to get it repaired after she retired, and even the guys who used to work with them said they couldn't do anything with it. It's a neat looking watch, but I think if my dad and aunt were still among the living, they'd have said "finicky" and "temperamental" are pretty generous descriptions of the electric models. Thanks for sharing all your knowledge and passion for Hamiltons! What an interesting story! There was a reason Hamilton upgraded the 500 to the 500A and then to the 505 in the matter of a few short years. I don't think the original designs were much more than protoypes rushed to the market. The 505 was better, but still no where near as robust as it's mechanical siblings. Just changing the battery was an opportunity to bust something imporant. I understand Hamilton eventually got around to replacing the electric movement with a quartz movement for warranty repairs. Rene Rondeau has a great book on Hamilton Electrics called "the Watch of the Future"... you can find it at www.rondeau.net He's also one of the few guys who can restore a Ventura to its "original glory" and a wonderfully personable watchmaker who's willing to share his advice. Read your comments. Rene is now restoring my Hamilton "Sea-Lectric I" Electric Model 500, serial #S213670 for me as I write. Thanks for posting! 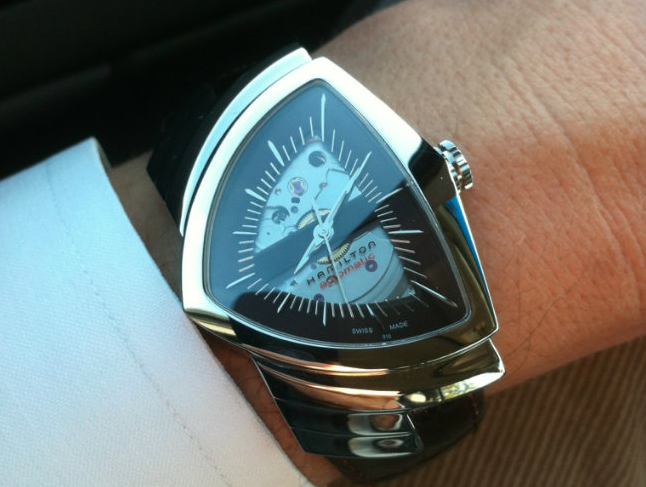 I'm not familiar with the 645 movement - I suspect it is a Swiss made caliber made by ESA. To my knowledge, only the 500 series (500, 500A, 505) were made in the USA by Hamilton.